James H. Brickley was born on November 15, 1928, in Flint, Michigan. He was raised in Detroit and received his bachelor’s and law degrees from the University of Detroit. Brickely received a master’s degree in law from New York University. Brickley’s career in public service extended through all levels of government, from Special Agent with the FBI, to Chief Assistant Prosecutor for Wayne County, and from United States Attorney for Eastern Michigan to Lieutenant Governor of Michigan. It is clear that he dedicated his professional life to public service. Brickley also served the academic community with his knowledge of the law. From 1975 until 1978, he was the President of Eastern Michigan University. Throughout his career, he served as an adjunct professor at several Michigan universities lecturing on the government and law. 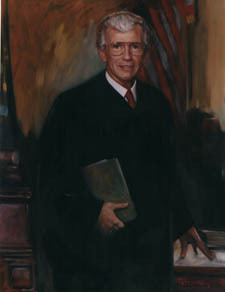 Justice Brickley retired from the court in 1999 and died on September 28, 2001.